The Yale Interdisciplinary Center for Bioethics offers an interview project as one of its Cases in Research Ethics, which describe choices faced by hospital IRBs in Connecticut. Case 3 concerns a nurse who was also a divinity school student, and who gained approval from her hospital's IRB to interview fifteen "hospital patients who were suffering from a progressive and/or life-threatening disease such as cancer" about their religious beliefs and practices and the role of religion in their feelings about their illnesses. Patients agreed to participate after "a thorough review of the purpose of the study, the nature of the questions and the time involved for participation." Eleven interviews went fine. Then the twelfth patient "became agitated and demanded the researcher leave immediately. The researcher spoke with the hospital nurses and was informed that this subject had 'fallen away' from her prior religious involvement and had wondered if her malignancy was divine retribution for her lapse." The researcher dutifully reported this as an adverse event. The IRB then reconsidered the project and voted 10 to 1 to forbid the researcher from interviewing the three additional patients. As described in the case study, the IRB recognized that, collectively, it knew little about this kind of research. "While this IRB was routinely accustomed to addressing the standard types of adverse medical events seen in oncology drug trials, it did not consider the possibly significant adverse psychological consequences of asking these same subjects about their religious and spiritual beliefs vis-à-vis their disease." Yet the IRB's awareness of its ignorance did not prevent it from stopping the research project. The case study does not give the reason for this decision. Was the IRB constrained by federal regulations? No, 45 CFR 46 exempts interview research unless it "could reasonably place the subjects at risk of criminal or civil liability or be damaging to the subjects' financial standing, employability, or reputation." There is nothing in the case study to indicate that was a concern. Did the IRB conclude that any study that might agitate a patient is unethical? One hopes not, for such a decision would prevent just about any discussion with any patient, particularly seriously ill ones. Did the IRB decide that such research is permissible, but only if the researcher takes specific measures to avoid upsetting an interview participant? This seems not to be the case, for the IRB did realize that no protocol can predict who will become upset by a question. According to the report, the IRB "concluded it was highly unlikely for the researcher to reliably have screened and thus excluded subjects who may have been troubled by this line of questioning or to have predicted which subjects might have been at highest risk of experiencing such reactions. In addition, screening and thus excluding such patients from study participation might seriously have undermined the scientific validity of the study." Moreover, if the IRB had thought of some additional measures the researcher could have taken, it could have allowed the remaining three interviews under those conditions. Perhaps the IRB decided that because "the researcher did not precisely delineate a research hypothesis," her research was not valuable enough to risk upsetting another patient. But how can an IRB that has admitted its own unfamiliarity with social research judge the value of such research? There may be additional details, not included in the case study, to explain the IRB's decision. But I fear that this IRB shut down the research not because it had upset a patient, but because it had upset the IRB. The IRB system is premised on the idea that risks and benefits are predictable. By challenging that premise, this project forced the IRB to face its own limits. And while the IRB reacted by pledging "to seek consultative advice in the future when faced with certain types of socio-behavioral studies," it apparently stopped the project without such consultation. This decision to block future interviews punished not only the researcher but also the three patients denied a chance to talk to her. By forbidding these adults from deciding for themselves whether they wished to speak with someone about their disease and their beliefs, even if it upset them, the hospital failed to treat its patients with the respect they deserve. Forbidding consenting adults from talking with each other is a grave act. While there may be occasions when it is necessary to shield patients from an incompetent or unethical researcher, this case study does not provide the justification for this measure. NOTE: Another case in the series, "An ethnographic study of homeless adolescents, describes an IRB with a much better sense of what prospective review of a protocol can and cannot do. Through careful reading of the federal regulations, it was able to approve a plan for a challenging ethnography with no major modifications. Is this a real case or one created for training purposes? I couldn't tell. As someone who has been both in the research role and IRB reviewer role on similar studies this strikes me as an account of the IRB failing to recognize that it lacked the experience and knowledge to do a proper review. The problem is compounded by the fact the interviewer also seems to lack experience. And, when a problem arose, the IRB failed to address it appropriately. It should have sought the necessary expertise, and required changes to the protocol and consent process. You write: "The IRB system is premised on the idea that risks and benefits are predictable." Well unexpected things happen, and that's recognized in the regulations, but in this case it shouldn't have been that hard to say "Gee, this person is interviewing people who may be dying about their religious beliefs in relation to their illness. Maybe that might bring up thoughts of impending death that could be distressing. Has the researcher considered this possibility and has she considered how to conduct these interviews in a way that minimizes the risk of distress to the subject?" Usually in interview studies where there is a possibility, even a small one, that the interviewee might become upset, there should be some type of contingency plan in the protocol if the interviewee appears to be showing signs of distress. The interviewer may be required by the protocol to ask the interviewee if they wish to continue or the interviewer may on their own accord decide it is best to terminate the interview. In some research interviewees may be offered access to counseling and other services. And all this should be covered in the informed consent i.e. the subjects should be informed that there is a possibility that the questions might cause distress, that participation is voluntary, that they can refuse to answer specific questions and that they can stop at any time. IRBs are not perfect but this strikes me as a good example of why some sort of independent review of social science research, in accord with the regulatory requirements, which was not the case in this instance, is important. 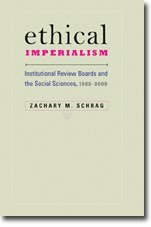 True, much social science research doesn't involve significant risk and should probably be treated as exempt, but there are plenty of research activities undertaken by social scientists where the IRB has an important role in identifying risks that the researchers have failed to consider and prepare for. First, my impression is that the Yale case studies are based on real events. They have been anonymized, though unless details have been substantially changed, it should be possible to identify the researchers involved once they publish their findings, if not before. Second, I agree with you that strategies exist to prepare a researcher for this kind of interview. Dr. Lois Sadler's comment on this case cites some literature offering such strategies, of which the most relevant appears to be Karen Kavanaugh, and Lioness Ayres, "Not as bad as it could have been: Assessing and mitigating harm during research interviews on sensitive topics," Research in Nursing and Health 21 (1998): 91-97. But Kavanaugh and Ayres do not claim that any strategy will prevent all participants from getting upset. People who are in pain will, at times, express that pain, and there is nothing wrong with that. And keep in mind that this researcher, a trained nurse, did have a plan: she explained to the patients what the project was about, and when one asked her to leave, she left. It's not clear to me that any other action would have been better. Finally, it would be lovely if IRBs played "an important role in identifying risks that the researchers have failed to consider and prepare for." But the system we have now gives IRBs enormous power to shut down research without requiring them to know anything about that research. This mismatch between knowledge and power regularly produces the kind of arbitrary decision-making we see here.